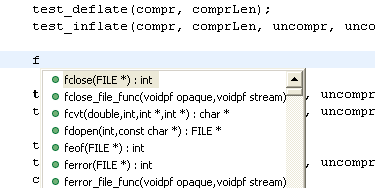 Code completion is one of the most basic features of a language sensitive IDE. Press Ctrl + Space and Eclipse would be of immediate help. But Eclipse takes it one step further. Pressing f and then Ctrl + Space brings in window for completion. Pressing Ctrl + Space again cycles through types of completions. In this case its for Code Templates. Word completions takes context sensitivity one step backward. (Or maybe forward.) It does not depend on context sensitive information. Pressing Alt + / would complete current word. The most important usage would be within comments. Where in you may want to explain about some functions/variables. The function name would not be context sensitive within the comment region but the word would still complete itself.